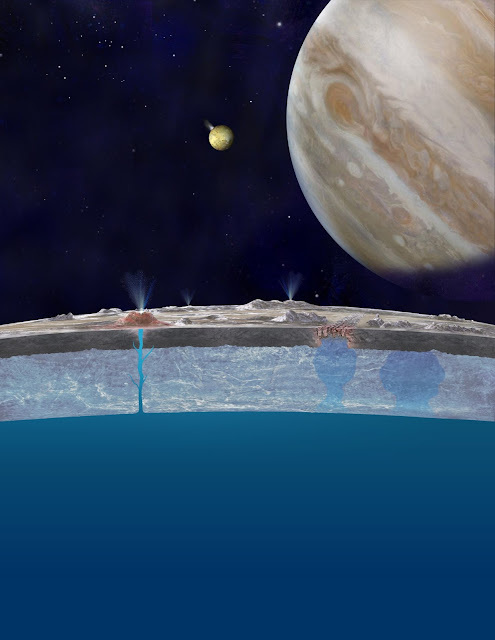 An Ancient Solar System...: What did Hubble see around Europa? NASA has found more evidence of water plumes over Europa, Jupiter's ocean and ice covered moon. It's more evidence of an internal ocean, which is great. Even better, it suggests a way to sample what's in that ocean without needing to drill through thousands of meters of rock hard ice. *It's amazing how some people will happily believe aliens frequently come to Earth and steal our underwear while texting the Lizardmen and Illuminati, but will balk at the idea of a team of scientists teasing new information from old data with upgraded software.